In August 2003, I was contacted by Julie with a story about her mouse Archie and a parasitic insect known as the Cuterebra fly. At the time I'd never heard of this parasite. Recently I've received information about another mouse that was infected and thought it would be a good idea to provide some information about this condition. The Cuterebra fly, also known as the Rodent Bot fly, lays it's eggs in an area frequented by the host animal. When the host passes over the eggs, the eggs attach to the host's coat. When the eggs hatch, the larvae burrow into the skin of the host and grow until just before entering the pupal stage at which time they are ready to leave the host. While in the host the larvae develop in a warble (lump) that grows in size. The larvae breath through a hole in the skin. Generally the larvae exit the host without causing long term problems. There is a risk that they can interfere with bodily functions by entering the trachea and blocking air supply or enter the brain. Clearly this is more likely in a small animal like a mouse. Do not try to remove the larvae yourself. If the larvae is killed inside the host, it will infect the host and possibly kill it. Either allow the larvae to mature and leave the host or, if it appears to be causing problems, have a vet remove it. Your site has been very helpful for me in the last 3 weeks and thought I would pass on some info that you may or may not have. 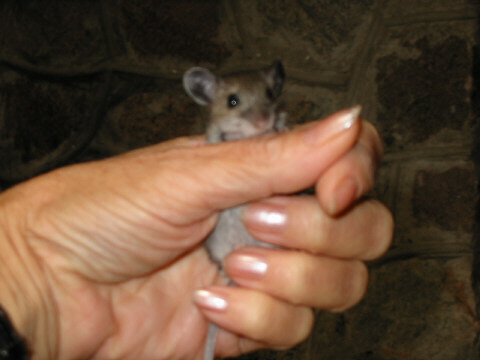 I took in a male baby mouse, eyes not opened, whose mother had drowned in our pool. He was probably about a week or so old as his eyes opened 3 days later. Kept him alive and thriving on puppy formula and now mouse food. I have had numerous domestic rats but never a mouse, wild or domestic. About 10 days ago he started to develop a swelling in his abdomen, not unlike a boil or infection. I applied warm salt water to no effect and it kept growing in size. After 3 days of this as the swelling grew, I took him to the vet. The short version is that the larvae of a cuterebra fly had burrowed under his skin and grown. The vet pulled out a slug/caterpillar that was literally a third the size of Archie, the mouse. It was horrifying to see and he must have been massively uncomfortable though not in pain. I'm not sure what the end result would have been had this bug been left but it was occupying a huge amount of his body cavity space. Archie is fine now, thriving and here to stay. Thanks for your web site and all the info and was a great help and hope this story may be helpful possibly to others as I gather these flies tend to lay their eggs around mouse nests.